The United States says that talks aimed at ending North Korea's nuclear weapons programme have reached stalemate. The US envoy to the talks, Christopher Hill, said the six nations involved had made no progress on how to verify North Korea's account of its atomic activity. 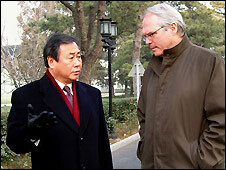 Mr Hill was speaking after the third and last day in the current round of discussions in Beijing. However some reports suggested he could extend his stay in the Chinese capital to try to make some headway. The Chinese had earlier circulated a draft agreement to address the verification issue, but this reportedly failed to win the approval of all sides. 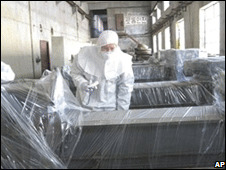 In February 2007, North Korea agreed to disable its plutonium-producing reactor and disclose its nuclear activities in return for fuel aid. But progress in implementing this deal has been plagued by delays, and the dispute over verification is the latest hold-up. In October, the US finally removed the North from a terrorism blacklist, and in return North Korea agreed to provide full access to its nuclear programme. The two sides now differ on the terms of verification that were agreed as part of the deal. North Korea insists it never said samples of atomic material could be taken away for examination, but the US asserts that the North did consent to the procedure. Mr Hill said on Wednesday that after a "tough, long day" of haggling over a way forward, the six parties involved did not achieve their goal. Significant progress in the talks would be a diplomatic victory for US President George W Bush before he leaves office in January. But many analysts say Pyongyang is unlikely to strike a deal before President-elect Barack Obama takes over the White House. The six-party process, begun in 2003, groups North and South Korea with China, Japan, Russia and the United States.